"Solving Crime One Facial Expression at a Time," is the tagline for Colin Fischer by Ashley Edward Miller and Zack Stentz, the screenwriting team behind X Men: First Class and Thor. Don't let any of this information shape a preconceived idea you might have about this fantastic new book about a high school freshman with Asperger's syndrome. Colin Fischer isn't the first kid's book to feature a character with Asperger's syndrome or autism. Al Capone Does My Shirts by Gennifer Choldenko, Rules by Cynthia Lord and Mockingbird by Kathryn Erskine came before. Nor is Colin Fischer the first mystery to feature a character with Asperger's or autism who solves a crime. Siobhan Dowd's The London Eye Mystery is a brilliant book from 2008 that artfully presents a believable mystery credibly solved by a main character who, while it is never specifically stated, clearly falls somewhere on the autism spectrum. And, of course, there is the award winning young adult book Marcelo in the Real World by Francisco X Stork and The Curious Incident of the Dog in the Night Time by Mark Haddon which, while written for adults, is appropriate for teens and features an autistic main character who solves a mystery. Add to this list the genius BBC program Sherlock that puts Holmes and Watson in a modern day setting. As Watson suggests in Sir Arthur Conan Doyle's story "A Study in Scarlett," Sherlock's "ignorance was as remarkable as his knowledge." This can definitely be said of the modern Sherlock as played by Benedict Cumberbatch as well as Colin Fischer, who has a picture of Basil Rathbone as Sherlock on the wall of his bedroom, a photographic memory, a ridiculously high IQ and a meticulous attention to detail, making him a perfect detective. I need to preface everything that I write here by stating that I have only a basic, Wikipedia-level knowledge of the autism spectrum and Asperger's syndrome. In fact, I was enthralled to learn the life story of Hans Asperger as I read Colin Fischer. I apologize if, in the course of this review, I say anything ignorant or upsetting to anyone who knows more and/or has personal experience with autism. In an interview on the program Here and Now Miller revealed that he and two of his children fall somewhere on the autism spectrum and, perhaps because of this, he and Stentz have presented an especially responsible, informed literary version of a teenaged boy with Asperger's syndrome in the pages of their book. In this day and age, I would be shocked if a major publisher like Penguin allowed an irresponsible or inaccurate representation of a character with autism or Asperger's go to print. However, I welcome all of my reader who read Colin Fischer to please leave comments as to the accuracy to the representation of this "neurological condition, related to autism," as Colin explains himself to his PE teacher. "The Notebook" is a spiral bound, red covered journal that Colin carries with him everywhere, taking notes on anomalies that interest him. Each chapter of Colin Fischer begins with a page from this notebook, presented in Colin's voice. I listened to Colin Fischer as an audio book, magnificently narrated by Jesse Eisenberg, and these pages, in addition to being written in the first person, are also narrated with a bit of an echo that makes Eisenberg sound like his in a metal storage bin. This is done to distinguish from Colin's voice and the third person narration that the rest of the book is written in. I mention this here because I read a review of Colin Fischer that claimed the point of view was confusing. I had no problem distinguishing between Colin's voice and the rest of the narrative, even as an audio book where I could not see that these sections were printed to look like pages from Colin's notebook. These passages are where Colin shares his encyclopedic knowledge of events that range from Lewis Carroll's philosophical examination of Zeno's paradoxes to the eating habits and digestive systems of sharks to the biography of Hans Aspergers to the Kuleshov effect (seriously, I feel quite a bit smarter having read/listened to Colin Fischer.) The lovely, writerly thing about Colin Fischer is that Miller and Stentz parallel Colin's observations and information in The Notebook with the events of the story. The plot of Colin Fischer is almost as much about Colin adjusting to mainstream schooling - high school at that - on his own as it is about him solving the mystery of who brought a gun to the cafeteria. Up until high school, Colin, the child of two rocket scientists with a younger brother named Danny, has had a shadow - a behaviorist who follows him through his school day, helping him to learn to read social cues as well as reign in his tendency to talk endlessly about a subject he is knowledgeable on. Marie has left Colin with an arsenal tools to make it through the day, including a well worn illustrated page of facial expression and their meanings that Colin refers to often throughout the book and uses to help him unravel the mystery. While the mystery that is the core of the plot of Colin Fischer is a bit thin at times (and, in all fairness, it is so, so hard to write a solid, complex mystery for kids and teens that they could realistically solve) the aspects of the plot that involve Colin wading into the social pool of high school are fantastic and often very moving. Colin begins his first day of high school getting a swirly in the boy's room from the very bully (and longtime tormentor) he ends up saving from taking the rap for the real culprit. As Colin takes notes throughout his day and gingerly makes conversation with Melissa, the only classmate who reaches out to Colin, trying to draw him in to conversation and birthday cake as her friends celebrate her birthday on the first day of school with a cake in the cafeteria, he also slowly finds himself doing new and surprisingly social things, including lying to his parents. A literal thinker, lying is beyond Colin and he turns to Melissa to help him script the words that he will speak to his mother over the phone when he skips out of detention to follow the trail of the gun with the frosting on the grip. Colin also has frightening moments that he cannot control where he resorts to the only kind of self-soothing behavior he knows. Loud noises and being touched are the two main things that can push Colin out of his comfort zone, causing him to bark like a dog, scream and, in the incident that got him detention, go ballistic on one of his classmates who intentionally hurts him during a heated basketball game in PE. 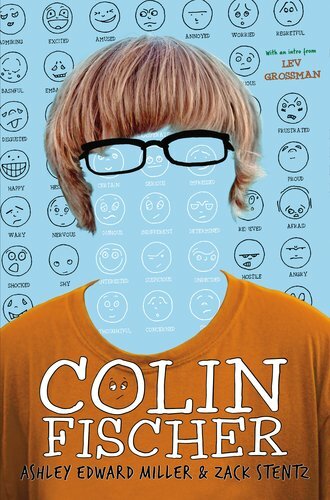 Colin's family also struggles with his Asperger's and new school life, Danny especially. Miller and Stentz's representation of the Fischer parents, while limited, feels genuine (as far as an upper middle class representation of parents of a child with Asperger's goes) in their concerns and efforts to arrange their lives around Colin's needs. And, in this, Danny expressed his frustration in an outburst that makes for a moment of tension more intense than the scene where the gun goes off in the cafeteria.